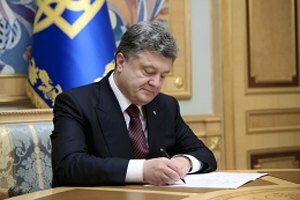 Petro Poroshenko has signed the decree, which puts the decision of the Council of the National Security and Defence as of 27 January on the strategy of Ukraine’s cybersecurity in force, official website of the President reports. "The aim of the Cybersecurity strategy is to create conditions for secure functioning of cyberspace, its use in interests of an individual, the society and the government," the message says. The strategy presupposes a complex of actions, priorities and directions, namely the creation and adaptation of the state policy directed at the development of cyberspace and the achievement of compliance with the EU and NATO corresponding standards, the shaping of the competitive environment in electronic communications, the provision of services in information security and cybersecurity. According to the document, the basis of the national system of cybersecurity is formed by the Defence Ministry, the State Service of Special Communication and Information Protection, the Security Service, the National Police, the National Bank, as well as intelligence agencies. Moreover, the National Security and Defence Council of Ukraine has instructed the Cabinet of Ministers together with the Security Service of Ukraine, the Foreign Intelligence Service and the National Institute of Strategic Studies to approve action plans for 2016 on the Strategy’s implementation within two months.